One of the world’s oldest religions, Zoroastrianism originated amongst Iranian tribes in Central Asia during the second millennium BCE and spread to Iran where it became the principal faith until the advent of Islam. Central to the religion is the belief in a sole creator god, Ahura Mazda, his emissary Zarathustra (Zoroaster) and the dichotomy between good and evil. A fascinating and diverse collection of artefacts, texts, paintings and textiles are displayed alongside spectacular installations that include a walk-in fire temple and a ten-metre glass etching based on the cast of the western staircase from the palace of Darius at Persepolis in the British Museum. 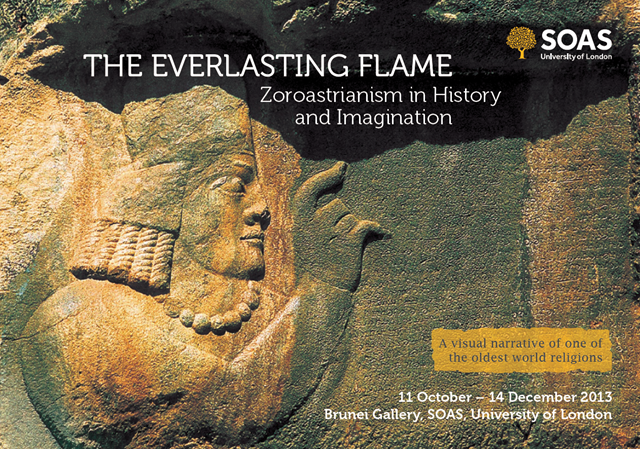 A two day conference, “Looking Back: The Formation of Zoroastrian Identity Through Rediscovery of the Past”, organised by the Centre for Iranian Studies at SOAS will take place at the Brunei Gallery Lecture Theatre on the 11th and 12th October 2013.